← Let the Planting Begin! 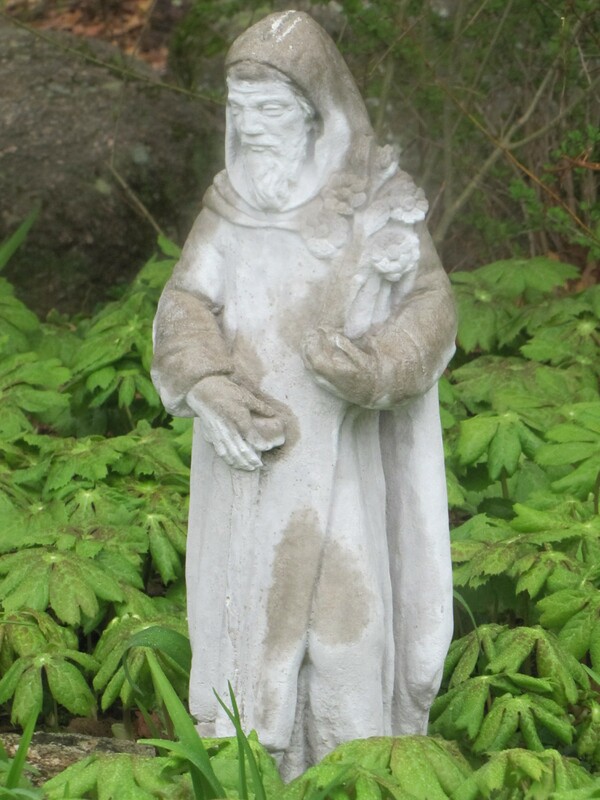 Visitors to my herb garden often mistake the large statue of St. Fiacre (Fiachra) for St. Francis. While St. Francis was born in Italy and is the patron saint of animals and the environment, St. Fiacre was of Irish descent and is said to be the patron saint of growing food and medicinal plants. Because he was so skilled with herbs and was seen as a great healer and holy man, hundreds flocked to him. In search of solitude, St. Fiacre sailed to France where St. Faro, the bishop of Meaux, gave Fiacre a solitary dwelling in the forest. The bishop then told him that he could have as much surrounding land as he could turn up in a day and was amazed at how much soil Fiacre had turned with the point of his staff. The anchorite cleared the ground of trees and briers, made himself a cell with a garden, built an oratory in honor of the Blessed Virgin, and made a hospice where many came to him for advice and relief from sickness. St. Fiacre prohibited women from entering the hermitage or the chapel, but they were content to offer their prayers outside. St. Fiacre’s relics are installed in Meaux Cathedral. To celebrate the Millennium, a garden dedicated to him was opened in 1999 at the Irish National Stud, County Kildare, Ireland. 6 Responses to Our Own Saint! How cool is that!! What is he holding in his hands? Seriously, I don’t know. Maybe HerbDoc can answer that question. That’s hysterical! It’s the first thing I grab when I come in from a long day in the garden. Maybe I should start stashing some outside, too. St. Fiacre is holding a flowering plant in one hand and a small spade in the other. The bottom of the spade is covered by Mayapples! Now that Dirtynails said that about Advil, I looked again and the spade almost looks like a very short crutch! Oh, I see it now. It does look like a crutch. Thanks!